THE WOODLANDS, Texas, Aug. 6, 2018 /PRNewswire/ — Summit Midstream Partners, LP (NYSE: SMLP) hereby announces that its subsidiary, Summit Permian Transmission, LLC (collectively, with SMLP, “Summit”), is holding a binding open season (“Open Season”) for firm transportation capacity on its Double E Pipeline (referred to herein as “Double E” or the “Project”). 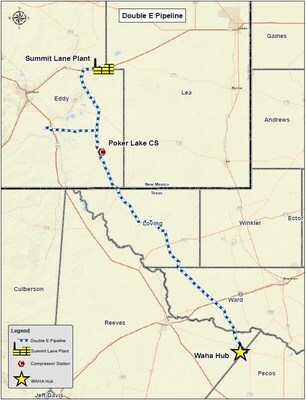 The Project will provide natural gas transportation service from various receipt points in the Delaware Basin to various delivery points in and around the Waha Hub, thereby connecting a growing supply of associated natural gas to a liquid trading point with multiple current and planned takeaway pipelines to demand centers along the United States Gulf Coast and Mexico. The target in-service date for the Project is the second quarter of 2021; however, the ultimate in-service date of the Project will be subject to, among other things, approval by the Federal Energy Regulatory Commission (“FERC”) and other governmental authorities, and actual construction of the facilities. This Open Season will commence at 9:00 a.m. CDT on Monday, August 6, 2018, and end at 4:00 p.m. CDT on Friday, September 14, 2018. Summit invites parties interested in obtaining firm transportation service on Double E to submit binding bids for such capacity during this Open Season. Double E will provide natural gas transportation service from the northern Delaware Basin to the Waha Hub in northern Pecos County, Texas, servicing various receipt points in Eddy and Lea counties in New Mexico and Loving, Ward, Reeves and Pecos counties in Texas. The Project will have multiple direct downstream connections, based on shipper demand and preferences. Additional receipt laterals and extensions are being contemplated as well. The approximate route for the Project is depicted on the enclosed Project Map. Actual pipeline sizing, capacity and route will depend on, among other things, the level of contractual subscriptions entered into as a result of this Open Season. A cost of service-based, daily reservation recourse rate will be available for transportation service under the Project, and this rate may change from time to time. The estimated initial recourse rate will be calculated using Summit’s estimated cost of the Project facilities, estimates for operation and maintenance expenses based on costs for similar facilities, the billing determinants under the Project, and other cost factors. Summit also offers shippers that execute a binding Precedent Agreement in this Open Season the opportunity to receive transportation service at negotiated rates, for a minimum term of 10-years, in lieu of the generally available recourse rates. In addition to the applicable daily reservation rates, shippers may also be responsible for compressor fuel and line loss make-up retention, electric power charges, commodity charges and all applicable surcharges as approved or required by the FERC for transportation service under the Project, all as amended from time to time. Summit has entered into a long-term binding commitment with a foundation shipper for up to 500,000 dth/d of firm transportation capacity on Double E. The commitment with the foundation shipper has been determined to be a prearranged conforming bid, and will not be subject to prorationing of capacity as a result of the outcome of this Open Season. The primary term for firm transportation service under the Project will be 10 years or longer. Summit may consider, but reserves the right to not accept, any requests for firm transportation service under the Project with a requested primary term of less than 10 years. Eligible firm receipt points may include new plant interconnects and new pipeline receipt laterals, both of which must be located in the northern Delaware Basin. Summit will consider receipt point requests outside of such parameters, but reserves the right to reject any such non-conforming receipt point request at its sole discretion, which it will exercise in a not unduly discriminatory manner. Eligible firm delivery points may include third party intrastate or interstate pipeline interconnects and additional other delivery points, all of which must be located in the Waha area. Summit will consider delivery point requests outside of such parameters, but reserves the right to reject any such non-conforming delivery point request at its sole discretion, which it will exercise in a not unduly discriminatory manner. Any shipper desiring firm transportation service under the Project must complete the Open Season-Double E Pipeline Precedent Agreement (the “Precedent Agreement”) found here: http://www.doubleepipeline.com/OpenSeason/PrecedentAgreement, which must be signed by a duly authorized representative of the requesting shipper, and deliver the completed Precedent Agreement by email to doubleepipeline@summitmidstream.com by the date and time indicated above, along with a completed and signed Confidentiality Agreement found here: http://doubleepipeline.com/CAOpenSeason.pdf. Summit reserves the right to reject and remove from consideration non-conforming bids, bids that have a delayed in-service requirement or other contingencies. Summit also reserves the right to reject any bid it deems, in its sole discretion, to be uneconomic. Bids that include a Precedent Agreement with any changes to, or that leave provisions blank in the applicable form, will be deemed “non-conforming” bids. Summit may reject non-conforming bids, or, if the non-conforming provisions are otherwise acceptable, Summit may, in its sole discretion, deem a non-conforming bid “acceptable” and include the bid as part of the firm capacity allocation process. Summit will exercise its discretion in this regard in a not unduly discriminatory manner. Summit will award firm capacity based on the highest net present value of the stream of incremental revenue produced by an acceptable bid, or combination of acceptable bids, received in this Open Season, up to the total quantity that results from the facilities that Summit determines, in its sole discretion, to construct. Any requirement that a shipper provide credit support will be governed by, and determined in accordance with, the terms of the shipper’s Precedent Agreement. This Open Season will close 4:00 p.m. CDT on Friday, September 14, 2018. Additional information regarding the Project is available at www.doubleepipeline.com. Summit Midstream Partners, LLC (“Summit Investments”) beneficially owns a 35.2% limited partner interest in SMLP and indirectly owns and controls the general partner of SMLP, Summit Midstream GP, LLC, which has sole responsibility for conducting the business and managing the operations of SMLP. Summit Investments is a privately held company controlled by Energy Capital Partners II, LLC, and certain of its affiliates. An affiliate of Energy Capital Partners II, LLC directly owns an 8.1% limited partner interest in SMLP. This press release includes certain statements concerning expectations for the future that are forward-looking within the meaning of the federal securities laws. Forward-looking statements contain known and unknown risks and uncertainties (many of which are difficult to predict and beyond management’s control) that may cause SMLP’s actual results in future periods to differ materially from anticipated or projected results. An extensive list of specific material risks and uncertainties affecting SMLP is contained in its 2017 Annual Report on Form 10-K filed with the Securities and Exchange Commission on February 26, 2018, and as amended and updated from time to time. Any forward-looking statements in this press release are made as of the date of this press release and SMLP undertakes no obligation to update or revise any forward-looking statements to reflect new information or events.